EndTag™ and PHOTOPROBE® Biotin labeled probes can be used to detect targets on Southern and northern blots as well as colony or plaque lifts. The same well established protocols for radioactive hybridization are employed but without the hazards and disposal issues associated with radioactivity. DNA Molecular Weight Markers can be used as easy size references. These ladders range from 0.2 to 10 kbps, are available biotinylated or unlabeled, are ready-to-use, and contain loading dye for monitoring electrophoretic mobility. This kit features the DuoLuX™ Chemiluminescent/Fluorescent Substrate (see page 13) and alkaline phosphatase streptavidin. One kit contains sufficient reagents to develop approximately twenty 100 cm2 blots. Detection is accomplished using biotinylated probes that are recognized by streptavidin coupled to alkaline phosphatase. 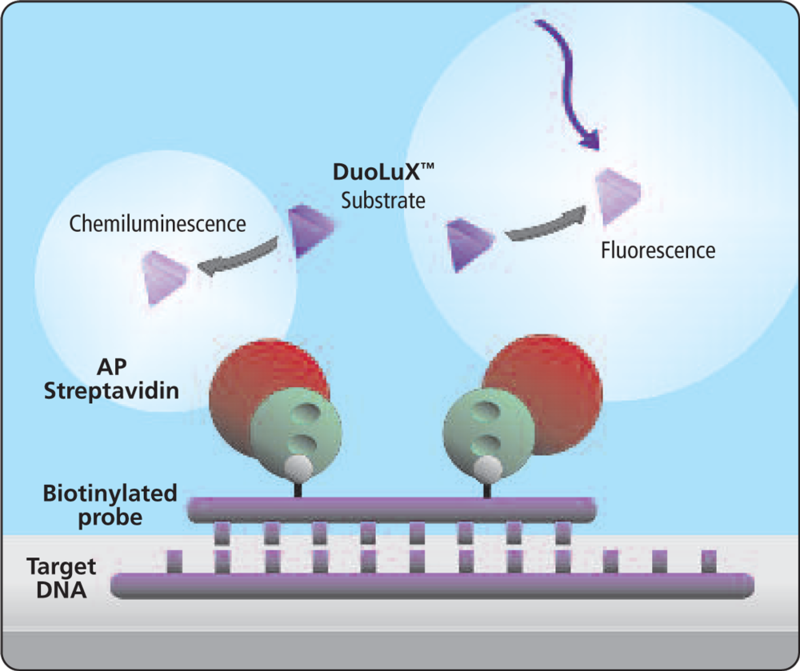 The probe is visualized by the conversion of the DuoLuX™ Substrate to a luminescent and fluorescent product by a dephosphorylation reaction catalyzed by alkaline phosphatase. Chemiluminescence can be documented and recorded by exposure to film or by image capture with digital imaging systems. Blots can be exposed to film several times over an extended period of time, with typical film exposure times of 30 seconds to 10 minutes. Sensitivities as low as 100 fg of target nucleic acid can be achieved. Optimal exposure times using digital imaging systems depend on the sensitivity of the instrument. Chemiluminescence can be developed on either nylon or nitrocellulose membranes, although nylon is preferred because of faster signal production. Alternatively, the fluorescence of the developed substrate can be recorded with a digital imaging system or conventional camera even months after the chemiluminescence has faded. Acquiring an image from the fluorescent signal requires a much shorter exposure time than from the chemiluminescent signal, often just a fraction of a second. The availability of many different labels and the wide range of detection systems allows the flexibility and sensitivity necessary for in situ hybridization (ISH). 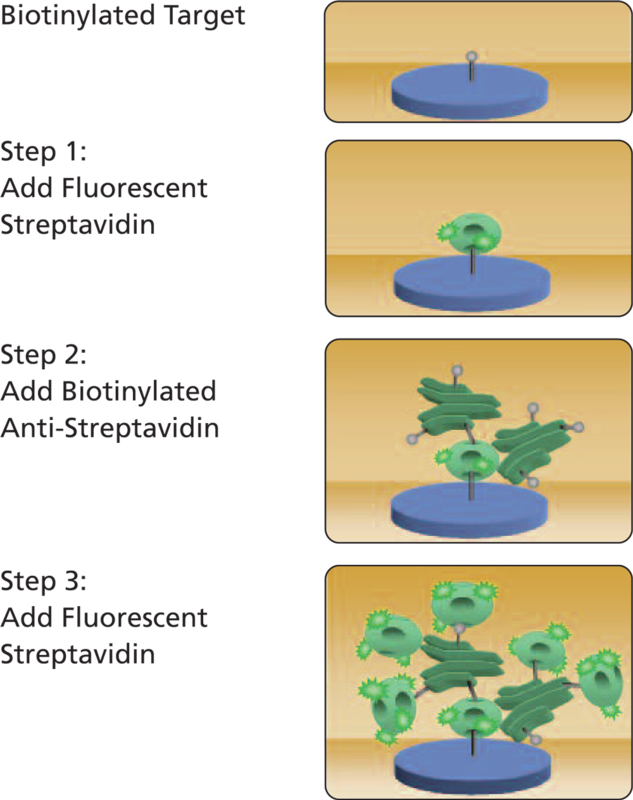 For example, for fluorescence in situ hybridization, biotin-labeled probes can be detected with fluorescently labeled avidin or streptavidin. For brightfield microscopy, alkaline phosphataseconjugated streptavidin followed by the enzyme substrate, BCIP/NBT, provides a sensitive detection method. Additional color choices are available with the use of the peroxidase-based VECTASTAIN® ABC Kit followed by the appropriate substrate (e.g. TMB, DAB, ImmPACT™ DAB, Vector® VIP, or Vector® NovaRED™). Haptens such as dinitrophenyl (DNP), fluorescein, and Texas Red®, for example, provide nearly equally sensitive alternatives to biotin. Several detection options are also available for these labels. Antibodies to these haptens, together with many fluorescent and enzymatic detection methods, provide a great array of possibilities for detecting probes. With the options available, the researcher has substantial flexibility in optimizing experimental systems, especially in cases where endogenous biotin or enzyme activity, or antibody cross-reactivity present potential problems. The available options also allow the simultaneous detection of multiple, differentially labeled probes in a single experiment. 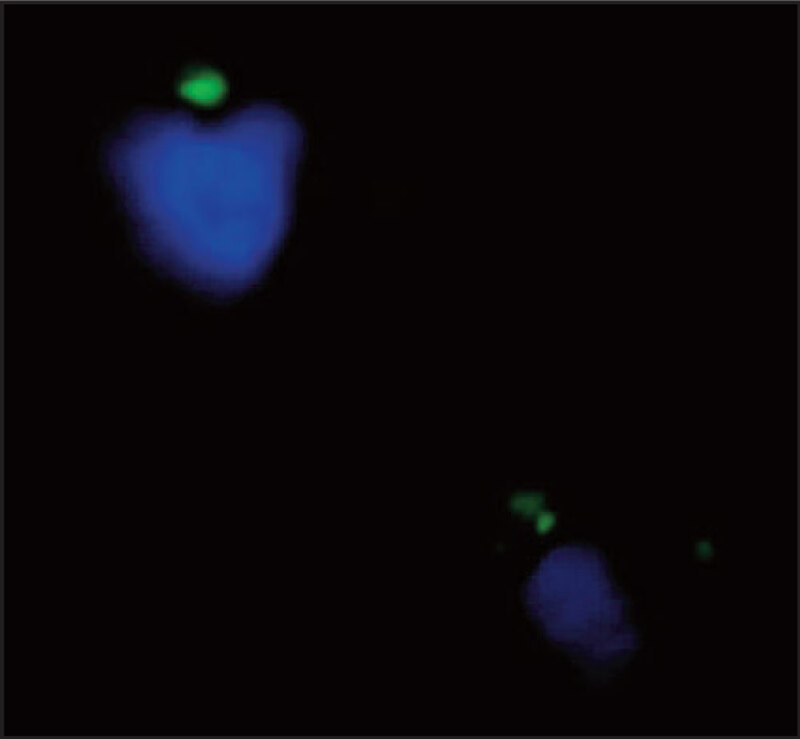 Comparative genomic hybridization (CGH), based on fluorescence in situ hybridization, is a technique for screening chromosomal imbalances in tumor tissue. Labeled DNA samples from two sources are competitively hybridized onto normal chromosome metaphase spreads: one labeled DNA sample is isolated from tumor tissue, the other, differently labeled DNA from normal tissue. 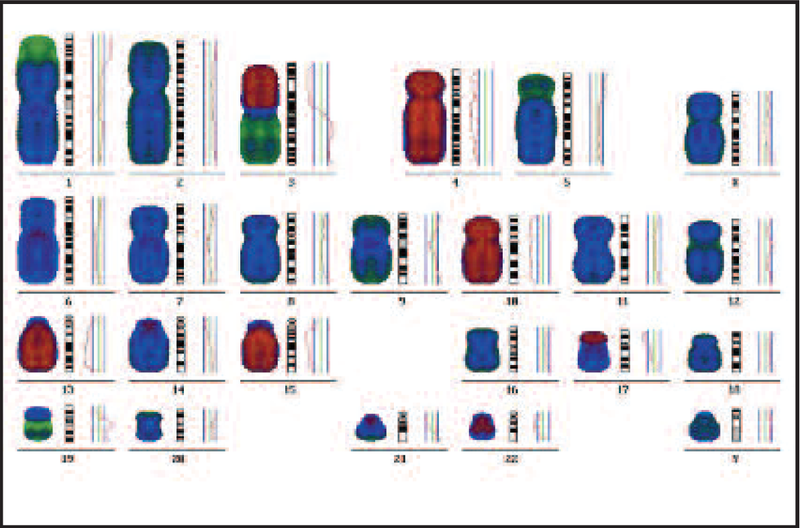 Based on the differential hybridization of the two different sources of DNA, the over- or under-expression of chromosomal regions can be mapped on the normal chromosomes. 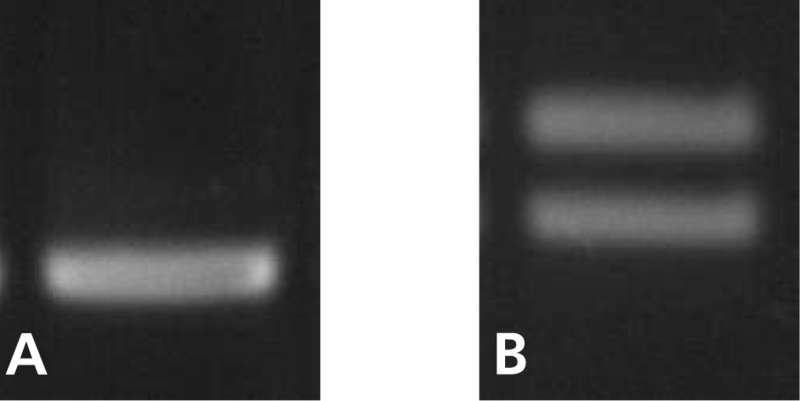 PHOTOPROBE® Biotin has been shown to be an effective labeling technique of highly degraded DNA from archival material for this analysis. 26, 27, 59 Often, DNA isolated from formalin-fixed, paraffinembedded archival tissue is reduced in quality, tending to be smaller than 1000 bp. Using the classical method of nick translation, the resulting labeled DNA fragments are usually too small to give a detectable signal. Because labeling with PHOTOPROBE® Biotin is non-destructive, the original, larger fragments of DNA are labeled allowing for the analysis of gains and losses of DNA from the tumor tissue sample. Over-represented chromosomal regions may correspond to tumor promoting genes, and chromosomal deletions potentially contain tumor suppressor genes. EndTag™ and PHOTOPROBE® Biotin labeled nucleic acids have been successfully employed in the study of intracellular trafficking of gene delivery complexes and nuclear import mechanisms of viral nucleoprotein molecules. Because these labeling systems do not destroy the nucleic acid nor create nascent nucleic acid, the original DNA or RNA can be tagged and traced throughout the experiment. • Immobilization of DNA target to a solid support for isolating sequence-specific DNA-binding molecules. Synthesizing a DNA fragment by PCR using a labeled primer ensures that the label is located only near the end of the DNA. The target DNA is thus bound to the matrix only at one end, minimizing interference in the binding domains. • Cloning or library screening by hybrid capture. Immobilized single-stranded DNA can be prepared by PCR amplification in which one of a pair of primers is EndTag™-Biotin labeled. Only a single strand of the PCR product is biotinylated. After binding the labeled DNA to a matrix, the unlabeled strand can be removed, yielding a matrix ready for hybrid capture. Genomic/cDNA subtraction, 1, 31, 51 microsatellite isolation, 2, 21, 50, 62 and library screening by hybrid capture24 require the removal or immobilization of nucleic acid hybrids. Affinity binding matrices are available for use with PHOTOPROBE® - or EndTag™- labeled probes for such applications. Irreversible binding of biotinylated nucleic acids to a solid support can be accomplished. Following incubation of Avidin D/biotinylated probe with a cellular extract, hybridized nucleic acids can be recovered by melting the doubled stranded nucleic acid and eluting the unbiotinylated single strands. 4, 23, 41 (Guidelines for this procedure are described on page 26). The ability to resolve DNAs of similar size in a gel is critical for applications such as differential display and Rapid Amplification of Polymorphic DNAs (RAPD) in which multiple DNA species need to be separated before subsequent excision and analysis. Two sequence specific DNA ligands bind to GC- or AT- rich sites on DNA and retard the electrophoretic migration of DNA in a sequence specific manner. A ligand is added to the agarose during gel preparation, and, during electrophoresis, the increased friction caused by ligand association with the DNA retards the mobility of DNA depending on the amount of ligand bound. The resolved bands can be excised and electrophoresed on a gel containing the second ligand, if desired, for confirmation of homogeneity or for additional resolution. The resolved DNA sequences can then be extracted for cloning, sequencing, or other analysis. The quantity of each ligand supplied is sufficient to prepare about 200 ml of agarose gel. Two 600 bp DNAs of different sequence form a single band using typical electrophoretic conditions (A).